TO PREPARE THE DUCKS: Three mallards, cleaned and gutted. Rinse ducks thoroughly with cold water. Season ducks with sea salt and freshly ground pepper. TO SMOKE THE DUCKS: Soak applewood chunks in fresh water at least 30 minutes. Prepare charcoal fire in smoker; let fire burn 20 to 30 minutes. Drain wood chunks, and place on coals. Place water pan in smoker, and add marinade to depth of fill line. Place ducks in center of lower rack; cover with smoker lid. 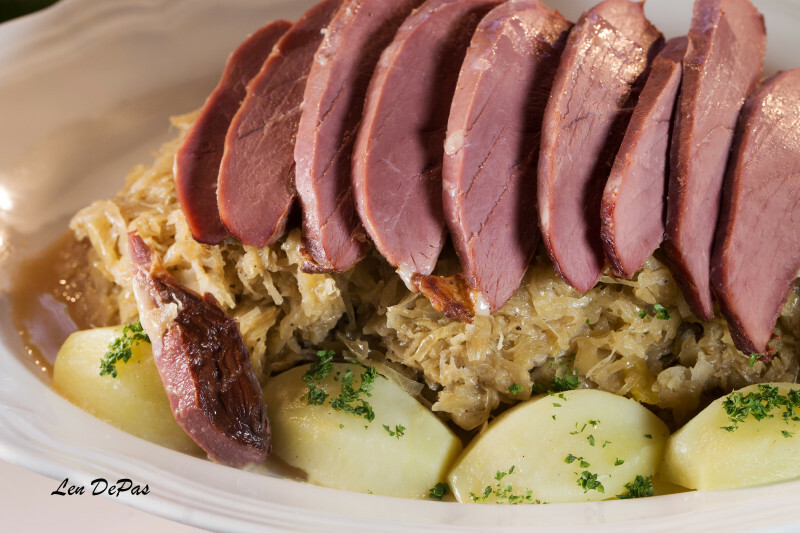 TO PREPARE THE SAUERKRAUT: Preheat oven to 350 degrees. Place the sauerkraut in a saucepan, add the onions and simmer until limp, but do not brown. Add the sauerkraut, pinch of salt, wine, and bouquet garni and bring to a boil. Cover, transfer to the oven and cook for about 1 hour. The sauerkraut should remain somewhat crisp. Remove from the oven, taste and adjust seasonings. 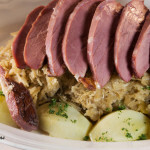 TO SERVE: On warmed plates, place sliced duck over sauerkraut. Serve with optional boiled or roasted potatoes. HINT: Sliced smoked duck served in a sandwich with condiments of your choice is delicious.